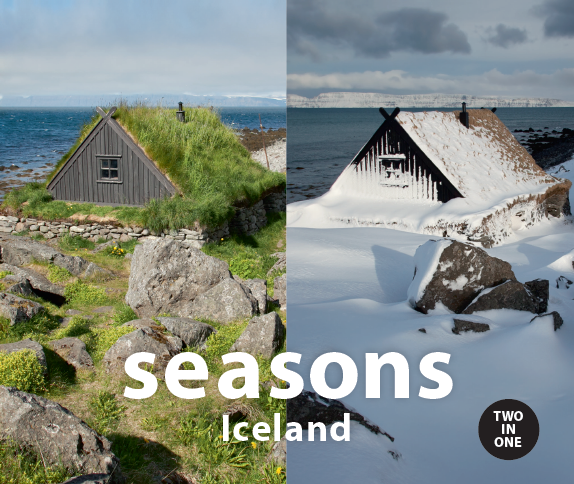 TWO IN ONE and Seasons feature images of Iceland photographed from the same viewpoint in summer and winter. Pictures of all the major sights ,Reykjavík, Geysir, The Blue lagoon, Gullfoss and many others. The photographs are accompanied by informative and amusing captions in English and German on life, culture and history. Geysir sometimes known as The Great Geysir, is a geyser in southwestern Iceland. 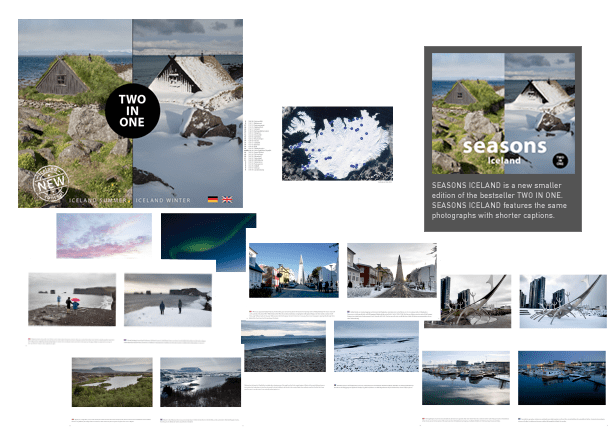 The books offer a unique perspective on Iceland, capturing the charms of two very different seasons from a single viewpoint, in a series of enchanting photographs. 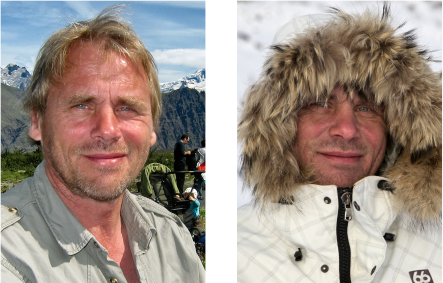 The twin images are taken from exactly the same spot – one in summer and one in winter. 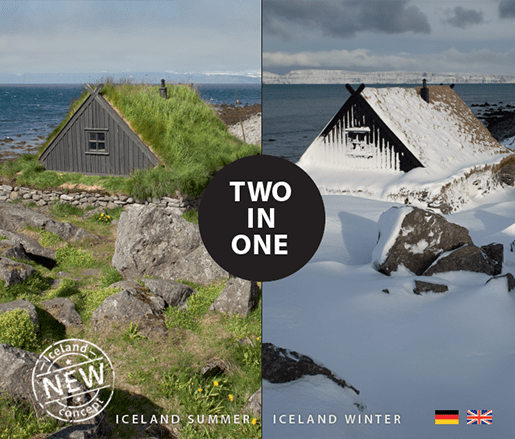 There are two faces to Iceland, a fresh bright summer and the white-blue winter aspect. Between them, everything changes; weather, landscapes and the way of life. Winter is the time to cuddle up in warm houses while fierce snowstorms battle it out above the rooftops. When the storm is over, prepare to take to the mountains, to walk, ski, or hunt, not least for good photo opportunities. Then, as the cold recedes and the tender light of summer takes over, people rekindle an enduring and passionate love-affair with nature, lasting deep into the long, light nights. In the past, the ability to sense imminent changes in the weather was a most valuable talent; survival depended on reading signs in the clouds and the colours of the sky correctly. Today, that same aptitude is necessary for the landscape photographer, although there is less at stake! The ability to interpret nature, light and clouds determines whether or not you’ll get a good picture. During the summer in Iceland the golden hour lasts around the clock, but it is equally rewarding to shoot in challenging conditions, bad weather or the bright winter light. Price: 44.5 USD. Available now! 168 pages. 20.5 cm x 19cm, 719 gr. Price: 24.5 USD. Available now! 168 pages. 12.5 cm x 10.5cm, 250 gr.